The vines are predominantly grown in the valley between the villages of Peñalba de San Esteban and Atauta. The name “23” comes from the number of plots of vines used to make this fruity and soft wine. Each of the 23 parcels has a name given by the ancestors of Rudeles. 95% Tempranillo (70% from 10-year young vines and 30% from 90-year old vines) and 5% Garnacha old vines (100 years old) grown at an altitude of 950 metres. Manual picking took place on 10th October, with strict selection of the grapes both in the vineyard and at the selection table in the cellar. Fermentation was temperature controlled at 25º during 10 days. The wine matures for 6 months in French oak barrels, and once bottled, is stored for one year before its release. Eight months in French oak (second year), medium grain and medium toasted followed by one year minimum in bottle before being released on the market. This elegant, velvety and award winning wine has a well-balanced structure with pleasant red fruits and spicy aromas. The oak is well integrated giving complexity and body to this refined wine. 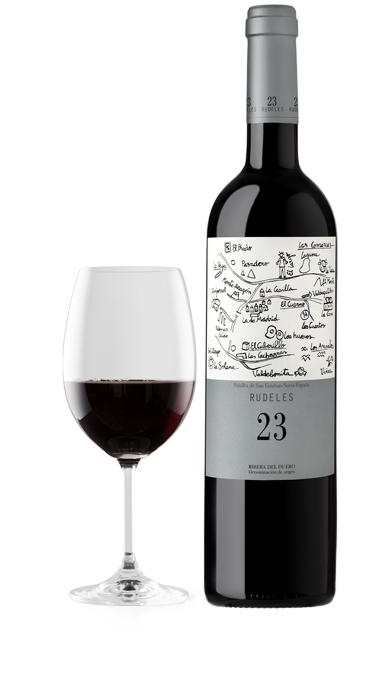 Tasting note from Gérard Basset, the 2010 world’s best sommelier, of Rudeles 23, Ribera del Duero, 2009: Medium ruby colour with a pinkish rim, it is a very appealing wine on the nose. I very much like the notes of red plum intermingled with soft spices that dominate on the nose. The feel of the wine is soft and not heavy. It would work superbly with a calf’s liver.